Tracy K. Smith, U.S. Poet Laureate, talks with Peter Biello at the Currier Museum of Art. U.S. 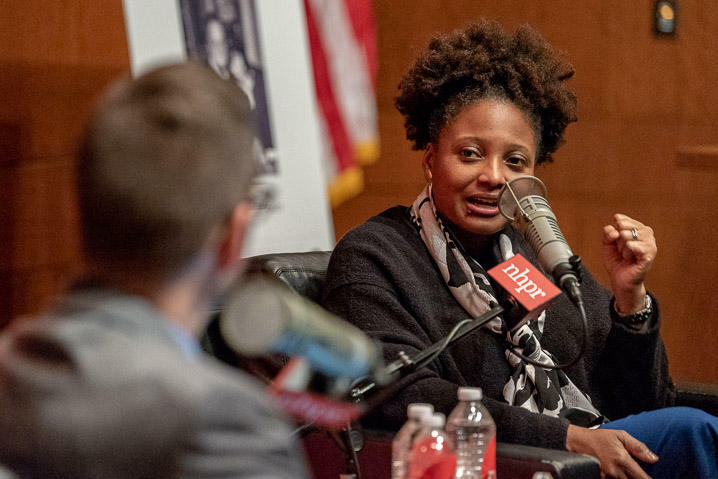 Poet Laureate Tracy K. Smith was awarded the Hall-Kenyon Prize in American Poetry at the Currier Museum in Manchester on Wednesday, December 12. The event featured a reading by Smith from her newest collection of poetry, Wade in the Water, and a conversation with NHPR's Peter Biello about her work and time as Poet Laureate. Smith also took questions from the audience during the event. Here is the full recording of Smith's reading (introduced by Wes McNair, one of the prize's founders) and her interview with Peter Biello.